Life for Edinburgh’s educated classes in the mid-eighteenth century may well have been more intellectually stimulating, more culturally satisfying, more varied than in London, a city more than ten times Edinburgh’s size. The primal darkness of medieval-inspired religious dogma in retreat if not vanquished by the economic and cultural prosperity of the British Empire. A new social class emerged whose members demanded political recognition in the form of a participatory role in civil society and government alongside the traditional landowning elite. Edinburgh enjoyed not only a commercial boom, but an outpouring of stellar events in the arenas of philosophy (David Hume and Thomas Reid), economics (Adam Smith), literature (James Macpherson and Walter Scott), science (Adam Ferguson and James Hutton), horticulture (Lord Bute), art (Allan Ramsay, Henry Raeburn and David Wilkie), and architecture (Robert Adam and the Playfair family). The National Galleries of Scotland celebrate Scotland’s achievements in the Scottish Enlightenment with three relevant exhibitions: “Scots in Italy” highlights how Grand Tourists like Lord Bute were given the equivalent of an Enlightenment University education in Italy prompting purchases of Old Master paintings to line the walls of their ancestral homes. 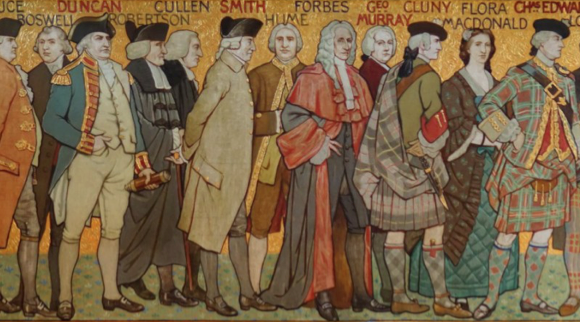 The ‘Reformation to Revolution’ exhibition sets the scene for the Enlightenment, tracing the way that the great figures of Scottish Protestantism laid the foundations for Enlightenment discussions. ‘The Age of Improvement’ exhibition presents the face of this new society with portraiture emphasising hard work, humour, and public spirit. We complement exclusive curators’ tours of these exhibitions with private views of the Georgian House on Charlotte Square and the Royal College of Physicians of Edinburgh, the magnificent Newhailes in Musselburgh, along with a walk among the memorials to Enlightenment figures on the majestic Calton Hill overlooking the iconic Edinburgh skyline. COST £1345 members, £1395 non-members, Single Room Supplement £195, including three nights accommodation at Roxburghe Hotel, all breakfasts, all lunches, all afternoon teas, two dinners with wine, all entries, all private views, all lectures, all curators’ tours, all travel within Edinburgh and out to Newhailes, tips, VAT and service. Includes travel from Glasgow to Edinburgh for those attending Bute tour. Excludes travel to Edinburgh for train travellers, and travel from Edinburgh at end of tour.